Actor and interviewer Gyles Brandreth brings his hilarious show to the Atkinson. Actor, author and One Show reporter Gyles Brandreth is coming to the Atkinson with his new one-man show Break a Leg! This show promises to have everyone roaring in the theatre aisles with laughter. 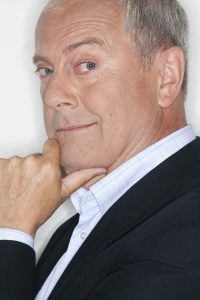 Gyles is one of the UK’s most recognisable names and is truly amazing live, ‘Break a Leg!‘ promises to be a side splitting evening of amazing comedic stories and one not to be missed! Sat 7 July at 7.30p. To book call Box Office on 01704 53333 or book online at theatkinson.co.uk. BBC Radio 2 Folk Award winners Ross Ainslie & Ali Hutton will play The Atkinson, Southport on Friday 6 April. Following on from the success of their debut album ‘Symbiosis’ Ross Ainslie and Ali Hutton will release their second album ‘Symbiosis II’ this spring. Winners of the best duo category at the BBC Radio 2 Folk Awards in 2017 and nominees for the same award in 2018, Ross and Ali have been busy in the studio creating an album full of new and original material. Packed full of their own compositions, partly commissioned by some of their fans, Ross and Ali have welcomed lots of their fellow friends and musicians to record on this album. Revolving around skilfully played guitar, cittern, whistles and bagpipes, which are the bedrock of the award-winning duo, the arrangements also include a full string section, the extensive use of synthesisers, drum kit and bodhran. The result is a much bigger sound with more adventurous and epic arrangements. Ross and Ali met in the Vale of Atholl Pipe Band when they were 12 years old. The boys were guided by one of the most influential pipers in the last 30 years Gordon Duncan. Gordon instilled a great passion in them for playing pipes with other instruments and they have gone on to play in many leading Scottish bands including Treacherous Orchestra, Old Blind Dogs, Salsa Celtica, Dougie Maclean, Shooglenifty, Capercaillie. Ross Ainslie is one of Scotland’s finest traditional musicians and composers, playing pipes, whistles and cittern. He is renowned for his highly acclaimed solo material, and as a skilled performer and prolific collaborator who performs regularly with bands Treacherous Orchestra (of which he is a founding member), Salsa Celtica, Dougie Maclean, Ali Hutton, Jarlath Henderson, Charlie Mckerron, India Alba and has performed with Kate Rusby, Blue Rose Code, Zakir Hussain, Trilok Gurtu, Capercaillie, Shooglenifty, Carl Barat, Papon, Karsh Kale, Flook, Breabach, Soumik Datta, Tim Edey, Patsy Reid, Hamish Napier. Ali Hutton, from Methven in Perthshire, was inspired at the age of 7 to take up the bagpipes and rose through the ranks of the world-famous Vale of Atholl Pipe Band. It was there that he was taught, alongside Ross Ainslie, by the late, great Gordon Duncan. He has since gone on to become a successful multi-instrumentalist on the Scottish music scene. Ali has performed, and worked alongside some of the most respected musicians, and bands on the scene, such as Capercaillie, Dougie Maclean, Carlos Nunez, Deaf Shepherd, Clueless, Steve Forman, Salsa Celtica, and Shooglenifty to name but a few. During his apprentice years as a professional musician he was fortunate enough to become a member of the multi award winning bands Brolum and Back of the Moon. He toured with them for several years across Europe and North America. Ali has also found himself producing some of the most well received Scottish Folk albums in recent years. Ali is currently a member of Treacherous Orchestra, Old Blind Dogs, Ross Ainslie and Jarlath Henderson band, and the new duo, cleverly named, Ross and Ali. Design and Photos by Somhairle Macdonald. Ross Ainslie & Ali Hutton perform at The Atkinson, Southport on Friday 6 April at 7.30pm. Tickets are £14 and are available online at theatkinson.co.uk, by calling 01704 533333 or over the counter during opening hours. 2018 sees King Pleasure & The Biscuit Boys celebrate a remarkable 30 years on the road. More than the greatest jump, jive and swing band on the planet, they’ve become an institution and they perform at The Atkinson on Saturday 7 April at 7.30pm. In their three decades, the band have delivered nearly 6500 performances in 21 countries, played on 36 radio shows and made 73 television appearances, including several on Blue Peter, The Teletubbies, as well as the Paradise Club series [where they were the house band], Challenge Anneka, The Gadget Show and on a prime time National Lottery advertisement – not to mention accompanying John Barrowman in a rendition of I Get A Kick Out Of You on Live And Kicking. Rough, tough and always rocking, King Pleasure & The Biscuit Boys have appeared at festivals, in concert and at clubs throughout the UK and Europe – and they still play the Birmingham Jazz Festival, where they have headlined for an unprecedented 14 years. The band has also performed alongside B.B. King, Cab Calloway and His Orchestra, Ray Charles, and toured with the actual Blues Brothers Band – the one from the movie. Along the way, the band have recorded 11 albums for Big Bear Records, all distributed worldwide physically and online. The band line up as King Pleasure [vocals and baritone saxophone], Boysey Battrum [alto and tenor saxophones], Bullmoose K Shirley [guitars], Mighty Matt Foundling [piano], Shark Van Schtoop [bass], and Gary ‘The Enforcer’ Barber [percussion]. King Pleasure and the Biscuit Boys comes to The Atkinson on Saturday 7 April at 7.30pm. Tickets are £15. Meet the Easter Bunny & Receive a Chocolate Treat! This Easter join Marty MacDonald, Henrietta the Hen and Professor Pinky as they enter the Easter Bunny’s singing competition – but who will Fluffy think has got The Eggs Factor? Marty MacDonald, Henrietta the Hen and Professor Pinky are all going to enter, but can’t choose which song to sing… can you help them practice and see if YOU have The Eggs Factor too? The prize is an exciting visit to the hidden Chocolate Factory – and a special chocolate treat from the Easter Bunny himself! Come and join the fun, songs and laughter down at the Chocolate Factory in…Easter Bunny’s Eggs Factor- then meet the Easter Bunny afterwards and receive a special Easter treat! Songs include children’s favourites Old MacDonald Had A Farm, Wheels On The Bus, The Grand Old Duke Of York, The Hokey Cokey, I Am The Music Man, Jack And Jill, Here We Go Round The Mulberry Bush and more! Easter Bunny’s Eggs Factor comes to The Atkinson on Friday 30 March at 2pm. Tickets are 9.50 / £7.50 children / £30 family ticket. This family show particularly suitable for 2-7 year olds and lasts for 40 minutes, followed by our popular meet, greet and treat with the Easter Bunny himself – includes a free Easter treat for every child. The Award-winning social enterprise A Great Little Place is opening a new café in The Atkinson. From September A Great Little Place, run by Autism Initiatives, will take pride of place in its new home in the Lord Street venue that welcomes 500,000 visitors a year to its Museum, Galleries, Library, Theatre and Shop. For The Atkinson it will mean working with an established local brand that is known for its high quality and value for money. We are able to work with A Great Little Place to maximise the programme with pre-show meals, themed events, festival food and more. The two organisations have shared values and vision. They will be an extension of The Atkinson family and together we will be able to provide the best in quality to visitors. This partnership is about more than just a café – its also about working together to improve the lives of people with autism and their families and by having the organisations together , new opportunities for training, work experience and training are going to be explored. A Great Little Place will relinquish its lease on Houghton Street and staff will be relocated to the new town centre venue. On Saturday 30 September at a special Coast themed Family Fun Day the actor, writer and producer Henry Normal (The Atkinson’s new patron) will officially open the cafe and the new Museum corridor that brings the story of the coast and all its creatures to life.